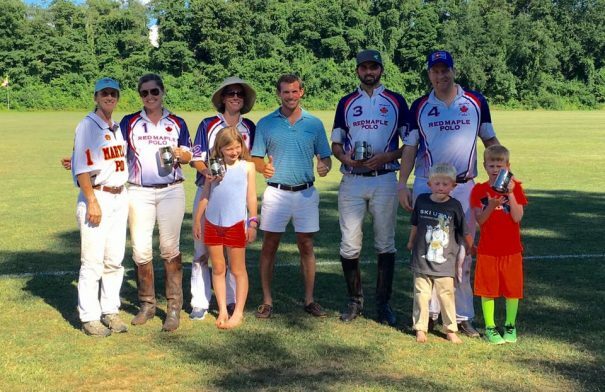 Last Sunday Maryland Polo Club joined Ladew Topiary Gardens and Old Line Society for a unique fundraising polo match called “Gallop to the Garden” benefiting Ladew Topiary Gardens. Roughly one hundred Old Line Society members supported Ladew Gardens in underwriting the cost of bringing Title I elementary school students to the gardens for a day of nature and discovery as a part of Ladew Garden’s environmentally-based educational programming. A 6 Goal Match was played between Red Maple and Dovecote/West Shore. Red Maple defeated Dovecote/West Shore. Red Maple was represented by Cindy Halle, Liv Stringer, Sara Orthwein, Nate Berube, and PJ Orthwein. MVP was awarded to Nate Berube and Best Playing Pony went to Tom Huber’s Sugar. Old Line Society provided lovely trophies and were presented by Justin Batoff.